Take the 3-Question Bulletproof SPS Survey now. Your good friend is suddenly eager to graduate to keeping SPS corals, after proving that he/she can manage basic water quality and successfully maintain soft corals such as Discosoma spp. mushroom corals and Xenia. What SPS corals would you recommend as good starter species or types? First, please rate the overall choices, then list a few of your personal favorites. 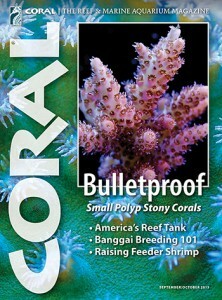 Answers may be used in the coming issue of CORAL on the subject of hardy SPS corals. 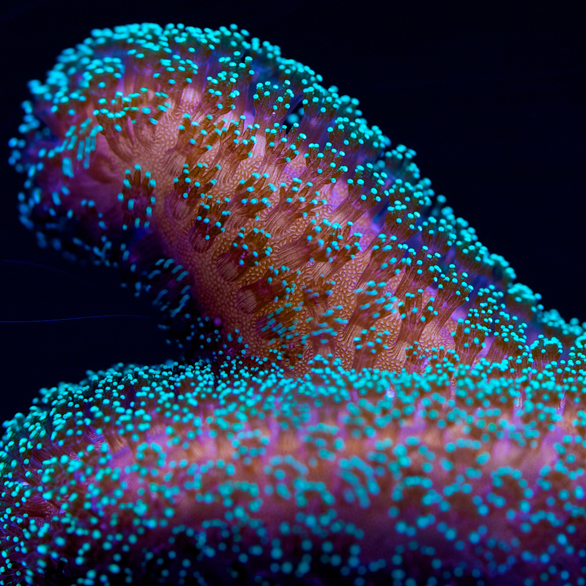 (CORAL September/October, 2015, Volume 12, Number 5). Of the readers who complete this survey, one will randomly be chosen to receive a free copy of The Adventurous Aquarist Guide to Marine Invertebrates by Scott Michael, an $18.95 value. Kat, it’s a purple Montipora sp. We’ll see if we can get a more specific answer for you. Just an updated response Kat – Than relayed that he believes it is just from an isolated section of a Rainbow Montipora. Just an updated response Kat - Than relayed that he believes it is just from an isolated section of a Rainbow Montipora. Kat, it's a purple Montipora sp. We'll see if we can get a more specific answer for you.